Bartzella leads my list of the the top 10 peonies because it hits the mark in every way that defines a great peony: fragrant flowers that are big, bold and beautiful, stems that are strong enough to display those blooms well regardless of the weather and foliage that remains attractive throughout the growing season, so that even when not in bloom the plant is an attractive part of the garden. Bartzella—an Itoh or Intersectional hybrid—is vigorous, making it among the easiest to grow and precocious to bloom. 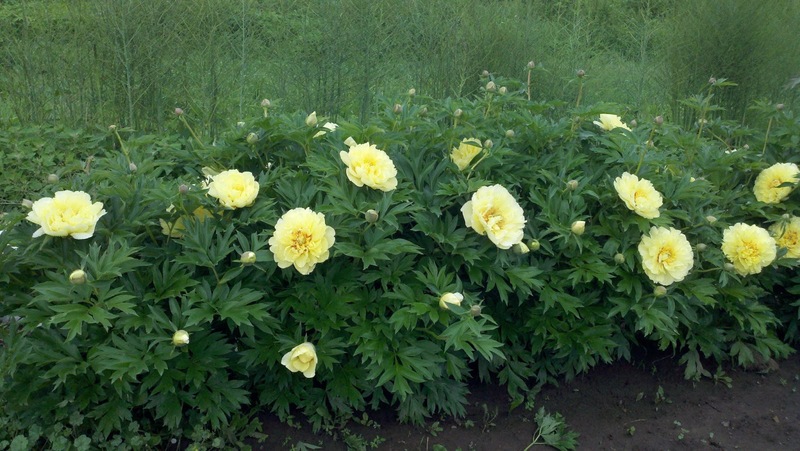 We have close to 75 plants in our commercial beds and personal gardens and, in more than a decade of growing them, have yet to see a problem with any of the bacterial, fungal or viral diseases that can sometimes damage peonies. It's a peony with great presence in the garden. Our plants regularly bloom out at 4 feet in height and will exceed that in width at maturity. So they can stand alone as a stunning specimen plant or add greatly to a mixed border. Many of these fine qualities stem from their heritage as an intersectional cross between the common herbaceous lactiflora peony and the woody-stemmed tree peonies thanks to the work of Wisconsin hybridizer Roger Anderson in 1986. Bartzella earned the American Peony Society's Gold Medal in 2006 and was one of the first peonies to get the APS Award of Landscape Merit. His creation cause quite a stir in the world of horticulture. Early on, single divisions of a Bartzella root were commonly fetching $1,000. Fortunately for most of us, the price has come down greatly as the supply has grown in recent years. It's still not an inexpensive peony, but I would argue that at current prices, it's the best bargain out there. Just one note of caution if you are contemplating the purchase of a Bartzella or two—or any other intersectional for that matter. Some of the plants offered for sale at nurseries or garden centers come from tissue culture propagation. These tend to be less vigorous and may even be genetically unstable. The best way to ensure you will have a Bartzella to enjoy for decades to come is to buy direct from a grower who propagates by root division like we do here at Fina Gardens. If you have Bartzella, please feel free to comment on your experience with this peony. Also, if you have any questions about the Intersectional varieties please post in the comments section.